Today it’s my pleasure to introduce you to an amazing lady. She runs the library at my kids’ high school – a school with more than 2,000 students. I love libraries. I’ve been to many, and I can tell you, this librarian makes a difference. How? She encourages a love of books and learning by making the library a happy place! Nooks to check out, Cappuccino Fridays, Blind Date with a Book . . . she’s got it all! 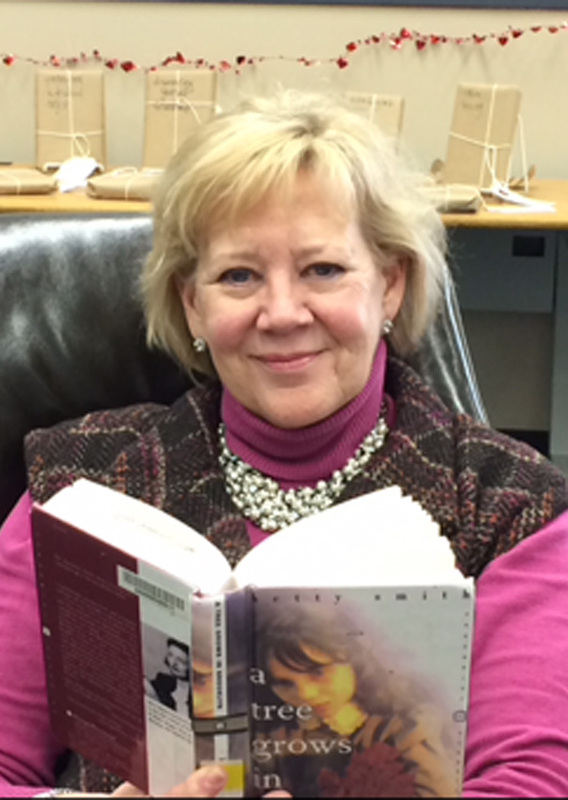 Please welcome Kathi Knop, librarian extraordinaire! Tell us a little about your job. And yourself . . . what were the steps to becoming a school librarian? Was that always your intended career path? I graduated from William Jewell College with a degree in Elementary Education and taught elementary school in the Hickman Mills School District for 10 years. During that time I got married and had 2 daughters. I stayed home for the next 15 years to raise Megan & Elizabeth. When Megan was an 8th grader, I decided it might be time for me to go back to work. After some soul searching thinking about what I really wanted to do I decided to get my master’s degree in Library Science, which was a wonderful decision. I spent four years going to Emporia, KS one weekend a month getting my degree. I don’t think I originally ever thought about being a librarian, but when I became one, I realized it was a dream job. What’s your favorite part of being a school librarian? I love the teaching part of being a school librarian. I love giving book talks and just being around and talking to the students. Because of our new 1:1 initiative, technology has become a large part of my job. The least favorite would be having to take time out to deal with computer problems, issuing new computers and chargers that have been lost or damaged, etc. How many students do you interact with on a daily basis? My days are always varied and I can interact with anywhere from 30-300 students. I think just talking to kids about books encourages them. Every year I have the young adult librarians from Johnson County library come gives book talks to the freshmen classes about current books during Teen Read Week in October. I also do book talks to the freshmen at the beginning of the year. I have also book talked different genres, such as biographies and non fiction books. This always gets kids to read something that they might not have before. I display new books as they arrive and books that bring awareness to a specified month, such as Black History Month, etc. This month we have a display called “Blind Date with a Book.” The books are wrapped in brown paper with a few key words on the front telling a little bit about the book. The first day we did the display, 10 students checked them out. I also have 15 Nooks that the kids can check out and take home. They might want to read a particular book, but end up reading lots more because so many are available on the Nooks. Are you seeing any trends in reading/literature at the high school level? Dystopian novels are still pretty big. I have also been ordering more GLBT books and have seen an increase in these books being checked out. Fiction books are definitely the most books that get checked out. Nonfiction books rarely get checked out any more. Students would much prefer to find their information online, which I can’t argue with, as I too like to have the most up to date information when doing research! What are five books on your to-be-read list right now? How many books do you read in an average month? I usually have three books going at once. I listen to a book in the car or when I walk, always have one on my ipad and one “real” book that I read on Saturday and Sunday mornings. Name some of your all-time favorite books. A Tree Grows in Brooklyn, My Antonia, Jane Eyre, Prince of Tides, The Woman in White, The Tortilla Curtain. Is there one book you think every high school student (or every person) should read? It would have be To Kill a Mockingbird. I think it is a timeless piece that has something in it to appeal to everyone. It is a moving novel that has life lessons. You’ll be retiring at the end of this school year. What will you miss the most? Most definitely the daily interaction with my colleagues and the students. The students give energy to every day! I will definitely NOT miss getting up at 5:15 every day. Tell us a favorite memory/story of being a school librarian. Wow. There are so many, it’s hard to choose one. Probably my best memory is having started cappuccino days in the high school library. When I first started at East, it was apparent that we needed to find ways to bring kids into the library. We started Cappuccino Fridays and sold cold cappuccinos and cookies. So many kids started coming in saying “So this is the library!” We would have about 3 classes in the library about every 15 minutes and make between $1,000 and $1500 each month. This also was very timely since our budget was taken away and we were still able to purchase new books for the library. Once a year we gave all our proceeds to an organization such as Habitat for Humanity, Heart to Heart International, the Red Cross, etc. This was definitely a rewarding, fun thing to start in our library. And of course there was getting to accompany a group of students to Italy and opening a brand new beautiful library at Mission Valley Middle School! Everyone who knows you knows that you’re one of the coolest school librarians ever: How would you like to be remembered? Ha!! I think just as a person who really enjoyed students and provided a comfortable environment for them to come to, whether it was to find a book, to study, or just to hang out and eat lunch. When you aren’t working/reading, how do you spend your time? Any hobbies? In the spring and summer it’s definitely gardening and working out in my yard! I’m just going to give myself a semester to see what happens. I will definitely be gardening and also volunteering. I want to volunteer at the Childrens Center for Visually Impaired and also Children’s Mercy Hospital. I love this quote because to me it says that we’re always thinking up new ideas, events, and the next new thing! ← Celebrate all the love! My mother was a school librarian, so I enjoyed this piece. Glad you enjoyed it, Theresa! Thanks for stopping by!